An environmental room is designed for the purposes of controlling temperature and humidity for applications such as cold storage, cultivation rooms, and Incubation. These rooms have different classifications that follow a grading scale based on the amount of allowable particulates in the air. Class one rooms have 1 particle for every 0.5 micrometer of cubic space and so on. The class number resembling the maximum amount of particles allowed in 0.5 cubic micrometers. 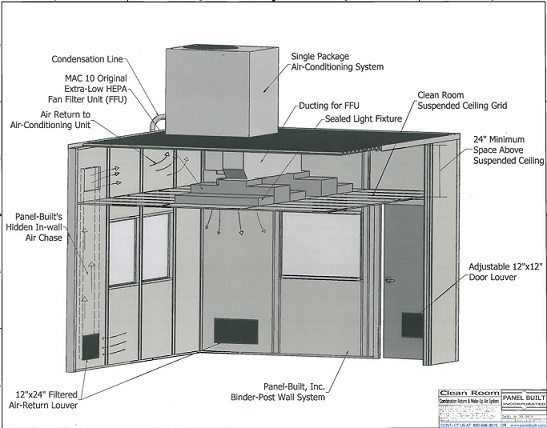 Environmental rooms use HEPA filters and Insulated Panels. These filters can remove up to 99.9% of the particulates in the air using various air flow technique. Our knowledgeable sales team can help you with the filtration and panel needs of your application. Call Us or Request a Free Quote to Get Started. Matchless strength and durability, is the “core” of our building quality. Our light-weight, highly portable structural panels meet all military specifications and exceed most national building codes and OSHA requirements. Our dedicated sales team provides confidential free quotes and CAD drawings to help get your project underway. Our team is available to answer any questions about a quotation, an order, freight options or project changes. Panel Built cleanrooms and mezzanines are 100% relocatable and expandable. Because they are made onsite, our products are ready 40 percent faster than stick-built. Ask about our 2 Day Quick Ship option to have you up and running even faster. Do You Have any Project Files?